An uncontested divorce basically means that both spouses agree on all of their divorce-related issues. Each state has specific legal requirements that must be met before a divorcing couple can proceed. You may want to consult with a local attorney or check your local courthouse website for the specific requirements. 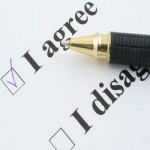 What if my spouse and I agree to divorce? If you and your spouse agree to a dissolving your marriage, this is called an uncontested divorce. There will be certain requirements that you will have to meet with an uncontested divorce. However it is often much easier than a contested divorce because spouses can dissolve their marriage without constant negotiations, legal posturing, and court hearings. This means that an uncontested divorce can usually involve less stress and fewer legal fees. Divorcing spouses must be able to remain amicable and able to work together towards mutually agreeable resolutions. They have to be willing to compromise in order to resolve all of their issues. Working with your soon-to-be-ex to settle important financial and child-related issues may seem difficult, an uncontested divorce is the best way to end your marriage without a full-blown court battle. You and your spouse have been separated the required period of time. Both you and your spouse have made the decision not to move forward with any counseling or wish to stay in the marriage any longer. You and your spouse have been able to comprise on child-related and or financial matters. You both SIGN the required COURT PAPERS stating that you AGREE that you are eligible for a divorce. The Law Office of Leslie Williams recommends for all parties involved, including children, that participants reach a mutually agreeable separation with terms that both parties agree upon. Leslie, recommends having a divorce attorney review the agreed terms to ensure your interests are protected. This is really a good course of action unless there are complex issues involving childcare or financial issues. Under these circumstances it is usually necessary for a divorce attorney to handle the legal issues. Call Leslie A. Williams today at (816) 533-4331 or use our web submission form to speak to an expert divorce attorney to help you make the right choices for you.